Over the past 8 months, Vitesse 300 rider, Eric Salstrand has moved up the ranks from a Cat 5 rider to a Cat 2 rider. Salstrand finished off his season with two impressive wins over the weekend. Saturday, Salstrand won the Arizona State Road Race Championships, held in Flagstaff, Arizona. Riders lined up for the 78 mile road race to face 20 mph winds and the fiercest competition in Arizona. "One of the best qualities of the Vitesse 300 is how stiff and stable the bike feels. The cross winds were pretty bad late in the afternoon and the field was all over the road. I never felt out of control and that is a great feeling," says Salstrand. The race finishes on a steep hill about half a mile long that levels out at the top for a 20 meter sprint to the line. Salstrand explains, "The Vitesse 300 is a do it all machine and after it powered up the climb I felt comfortable with it in the sprint against my competition. When the dust had settled I had one by a foot at the most; what a way to end the state championships!" 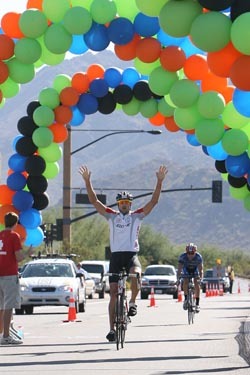 On October 14th, over 1000 riders participated in the 4th Annual Tour de Scottsdale. Tour de Scottsdale is a 70 mile road challenge that raises money for the McDowell Mountain Land Preserve. Velo Vie team director, Rich Weis, put together a formidable team and led the strategy that propelled Salstrand to 5 minute time gap over the pack. "Great team experience and pure, unadulterated strength were key factors in the Velo Vie win, not to mention the V300's ability to take on pretty much anything you throw at it," says Weis. Salstrand finished the race a bike length ahead of the next contender. Says Salstrand, "This was my last race of the season and maybe the most fun I had all year. There is nothing like racing a great race bike with a great team." "We are extremely excited about the achievements of our Velo Vie athletes using our bicycles and technology to reach their cycling goals," says Homayoon Farsi, CEO of Velo Vie. "We listen to our riders and enhance our products based on feedback from our cyclists around the world. We congratulate Eric Salstrand and the Velo Vie team on an outstanding victory," added Farsi. Velo Vie is a Scottsdale-based company, founded in 2006 that manufactures and sells high performance and racing bicycles direct online. The company offers highly customizable bicycle frames featuring the Velo Vie Carbon Axis technology. Velo Vie offers consumers top quality components through its relationships with manufacturers such as Shimano, Campagnola, SRAM, Zipp, Fulcrum, Reynolds, Easton, Vision, Profile, Ritchey, FSA, Deda, Rolf, Time, Speedplay and Look. Velo Vie and Carbon Axis Technology are trademarks of Velo Vie. All other trademarks and brands are the property of their respective owners. For more information about Velo Vie visit www.velovie.com. Contact info press@velovie.com or call 1-877-VELOVIE.